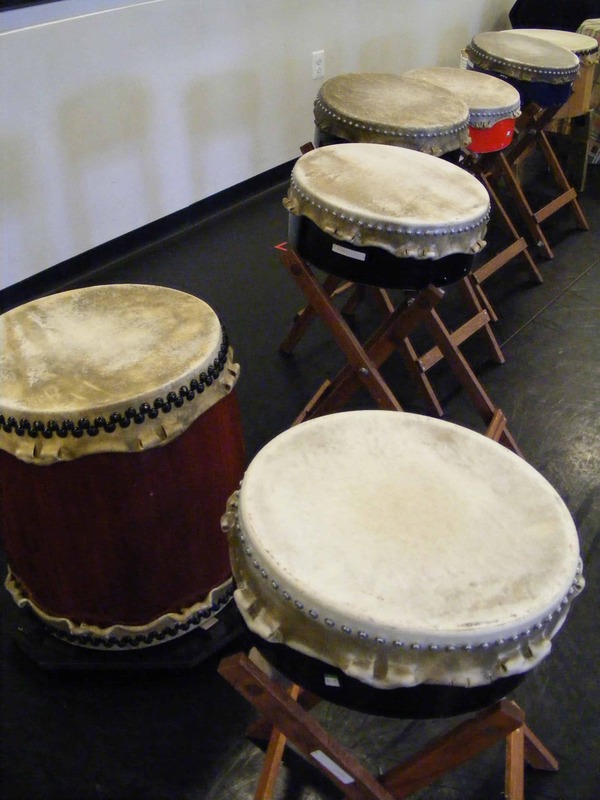 You are here: Home / Adult Recreational Class: Takoma Park / What Is Taiko? This may seem like a pretty straightforward question at first glance, but I have learned over the past 15 years that there are as many different answers to this question as there are people you might ask. 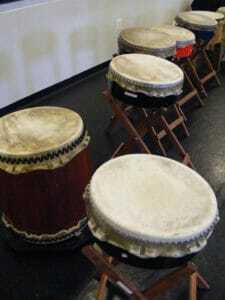 Firstly, “taiko” is a word used to refer to any drum in Japan. A snare drum is a “taiko,” a djembe is a “taiko”. 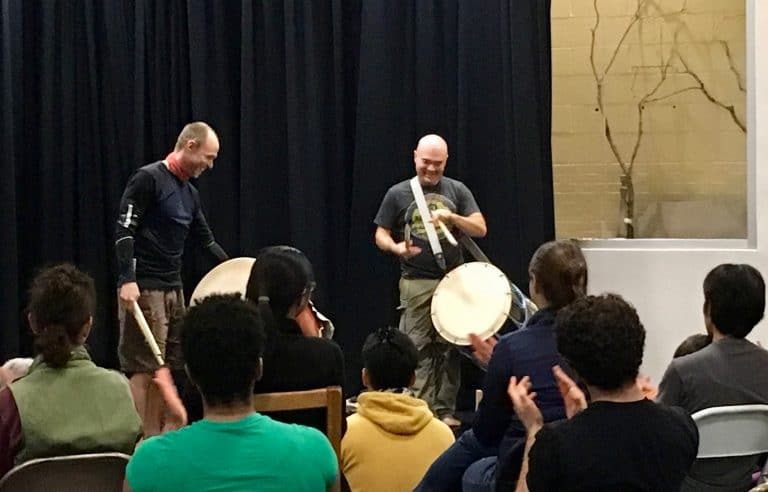 But to the English-speaking world, “taiko” is a term that has come to mean “a traditional style of Japanese drumming” (what the Japanese would refer to as “wadaiko”). 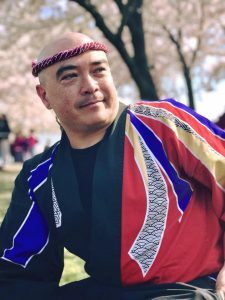 And this can also lead to a tremendously open field of interpretation because there are actually many styles of “traditional” drumming in Japan – everything from the courtly “gagaku” to the theatrical traditions accompanying “kabuki” and “noh” performances to the folk music, “min’yo”. To further the confusion, much of what people know of as “taiko” is a very modern version that has only been around for about 60 years. This is often known as “kumi-daiko” in reference to an ensemble of drums (a style of taiko credited to Oguchi Daihachi, a post-war jazz drummer commissioned to interpret an ancient rhythm for Osuwa Shrine which he did by having a large group of drummers play together). This was unusual since most traditional forms of taiko involved only one or two drummers, usually accompanied by other instruments. Since the invention of kumi-daiko, much of what the world thinks of as “taiko” has spread globally because of groups like Ondekoza and Kodo. These groups took largely festival traditions (“matsuri bayashi”) and presented them with a more theatrical sensibility. These performing groups became known for their drumming but also presented many other instruments, dances and singing involved in these festival traditions. And as taiko spread further and further into the world music forum, influences from many traditional and modern styles of music started emerging in taiko. The physicality of playing such huge drums (sometimes as large as 6-8 feet in diameter or greater!) and training rituals that some taiko groups endure lead many in the West to equate taiko to a martial art. And while there are similarities, taiko is really much closer related to traditional forms of percussion and dance. To me, taiko is the exchange of energy. That’s all. Nothing more complicated than that. It is the relationship of energy between a drummer and a drum, between a drummer and their fellow drummer(s), and between the drummers and anyone experiencing that drum. Taiko is a very powerful tool for expression of energy but it is just that – a tool. Taiko players ARE their own instruments. We employ sticks and drums and other instruments but it is our bodies and voices and “ki” that activate expression of energy. And, yes, this can be said of anything that you approach with the right mindfulness and intention – other instruments, other arts, other pursuits of any kind. But I get to hit big drums with big sticks. End of the day, I don’t know of much else more gratifying. To see and hear taiko, check out Mark on YouTube and Flickr. Better yet, catch him at his next performance! Want to know more about this history of taiko? Visit Rolling Thunder’s Taiko History page.